I realized recently that summer has flown by and I gave exactly zero garden updates in three and a half months. I spent the last couple of weeks prepping my garden for a fall transition but I’m still hanging on to summer. My cherry tomatoes are still ripening, I’m just now getting peppers (mild and hot) and baby cucumbers are hanging on for dear life. I’m also still holding out hope for one zucchini to grow, just one (I know what I did wrong this year so I’ll correct it next year!) Summer was a bit of an adjustment for me in terms of growing plants in a warm and dry environment. I didn’t water enough and I think the plants received too much sun. But in the past month, the plants have made a rebound and I’m not giving up on them yet. This dish is half tomatoes from my garden and half tomatoes from a friend. I’m not ready to quit eating tomatoes. 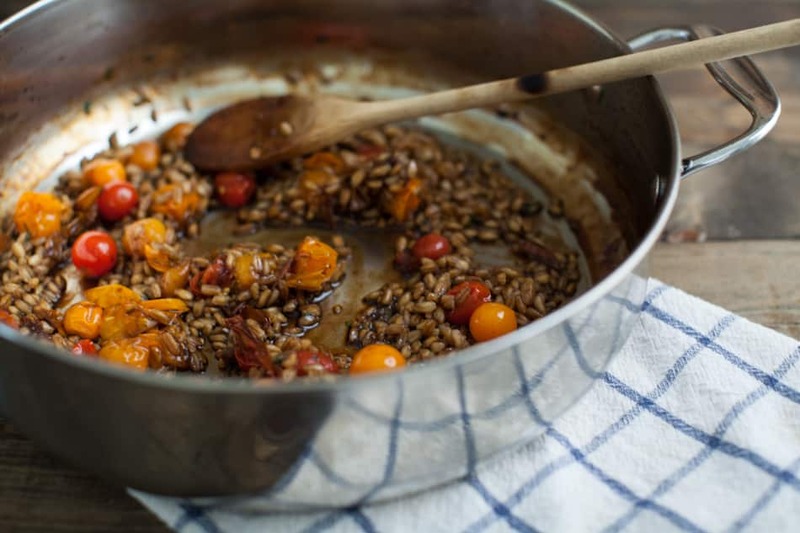 This farro looks so good and pretty! 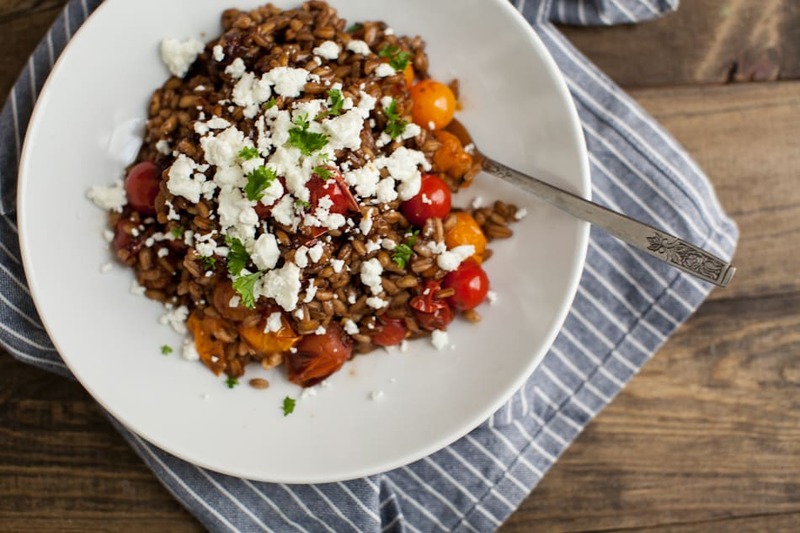 I love the bursted tomatoes and goat cheese! 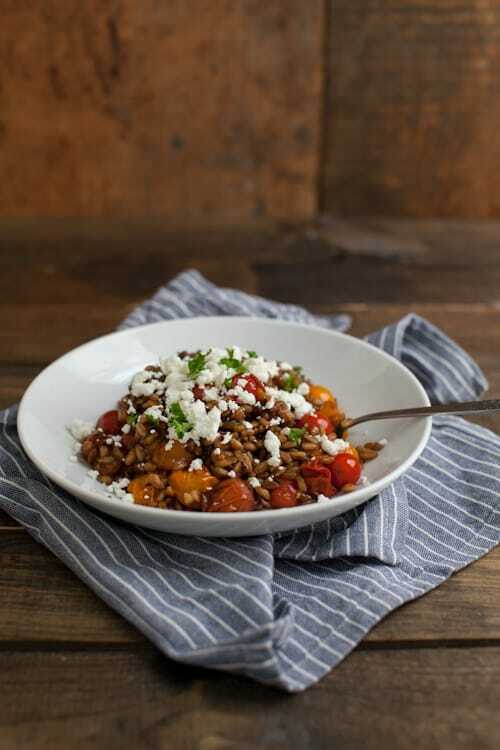 To be honest, I’m not quite ready to give up on summer veggies yet either and some burst tomatoes with farro definitely sounds like a good way to keep them alive! Your garden looks beautiful, lovely pictures! 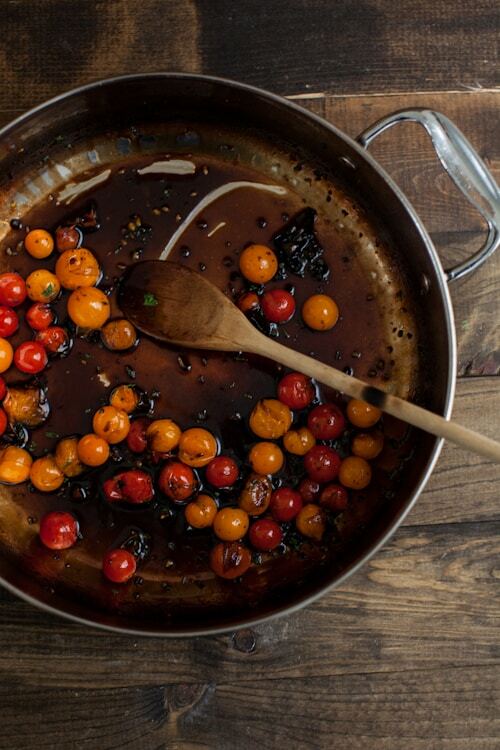 Tomatoes, herbs, garlic, and balsamic! It is so good on it’s own you don’t even need the cheese. But I would still not leave it out! So good! Hi, this looks amazing, although I’m intolerant to gluten. 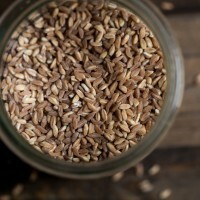 Reckon quinoa or toasted buckwheat groats would taste just as good? Or even brown rice? Any substitute suggestions would be fab. Love your recipes! I think this would be great with any of those choices- I’d probably gravitate towards the toasted buckwheat, sounds delicious! Made this for dinner tonight – fantastic! I will absolutely make this again and again. Love your site, glad I found it! I just made this for a quick dinner and it was delicious! 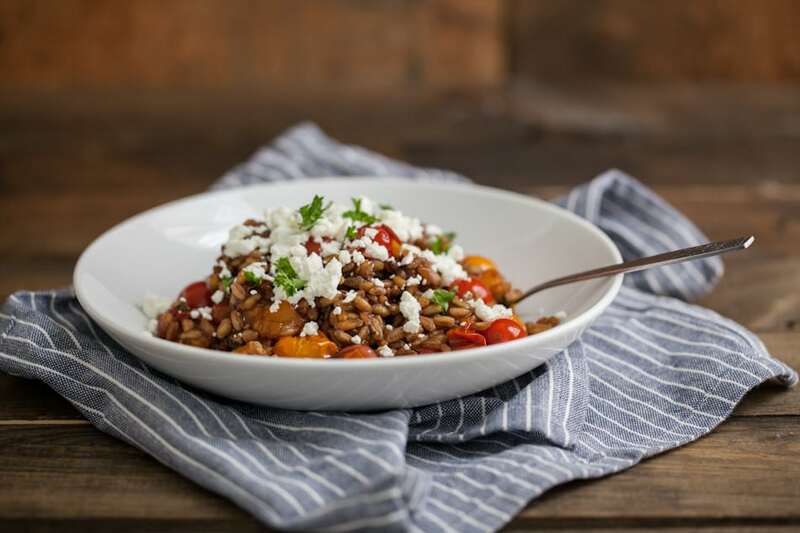 I had some cooked farro in the fridge, so it came together super easy.